The non-stick cerami-tech coating combined with the induction bottom distributes high heat quickly and evenly to the entire cooking surface to perfect steaks, vegetables, omelettes, pancakes and more. 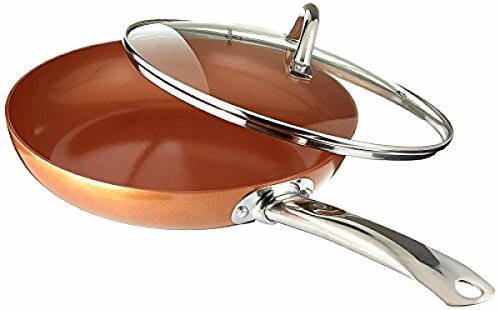 The 10 saute pan with glass lid works in ovens as well, sear a steak on the stove top, then bake to desired degree of doneness – all in the same pan. The beautiful glass lid allows you to keep an eye on your cooking, without losing heat. TEMPERED GLASS LID. The beautiful glass lid allows you to keep an eye on your cooking, without losing heat. The lid provides faster cooking results by keeping foods hot. With thermal shock resistant technology, there is no fear of shattering, and the ultra-durable design increases performance level.